13 looks like a normal skitarii ranger, his skin under his robes is quite pale while the exposed skin on his arms is closer to a brown. His eyes are dark brown, but they are covered by blue glass, and his hair is brown. If he took off the glass on his eye you would see that he has no eyelids, the glass is filled with a liquid that removes the need to blink so 13 can learn everything about his envrironment as best as possible. 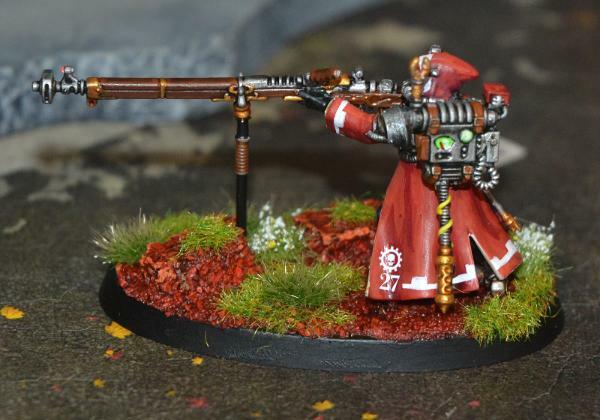 He has a special pocket for his revolver on the side of his robes and his rifle has a sling that goes around his shoulder. He has a backpack that holds supplies and extra ammunition. He has lead lined robes that are red with the mars symbol on them. He is 1.8 meters tall and is 5 years old since he was vat born. His alignment will be towards lawful good but he will go against this if there is something that directly goes against his beliefs or religion. A high power revolver with a special type of burning ammo which can be triggered to melt lock and wooden barricades, comes with a silencer. It can hold 6 bullets which are all reloaded at once but that replaces the entire clip which can be scavenged after the battle. The reload takes a total of 3 seconds. It is close semi auto although too many shots in rapid succession will make it a lot harder to aim. The maximum range of the gun is 300 meters, although the power and accuracy will significantly go down. It has iron sights that work but are fairly inaccurate, these can be replaced with proper modern sights although this will take time and resources. 13 can run around while shooting, albeit inaccurately, to cover his escape or to secure an area. To be hit by this is to feel like you've been hit by a highly powerful revolver and then have the wound burn up within you. This can sometimes cauterize the wound but will often cause more damage. 13 can put the special 'fire powder' on his hand to be used as a literal strike anywhere match. The bullets are equivalent to a .300 round. A high power sniper rifle based on top of a tripod that can only be shot with full accuracy while on the ground and with 13-Jzall standing still, although the tripod can be set up quite quickly depending on 13's speed. It can hold 3 bullets including the one in the barrel and is bolt-action. Changing the bullet takes 1 second and reloading takes 5. The tripod takes around 5-10 seconds to set up depending on where he is, it can be shot without the tripod just not that well. The bullet type is 14.5x113mm which has an effective range of around 2000m. To be hit is to not notice anything until it is too late. It enters and exits your body as fast as lightning and is no less deadly, although it can not set things on fire, it can be used to break locks or windows without being seen. The godbreaker ammo is necron 'flesh' that was given to him by trazyn the infinite, if not destroyed completely it will grow back until it fills the vial it is contained in. When 13 is using it, he pours some into either his sniper rifle cartridge or the chamber where he will be putting one of his revolver bullets in. The unique necron flesh has the ability to go through almost all natural barricades and the warp energy that it is cased in will get though all but the most difficult magical ones. The vial is a normal test tube filled with a thick, grey liquid. 13 grabs one glass containers that contain the powder that he uses on his bullets and he throws it at his enemy or something he wants to burn down. The Shape of the container is a 7cm high dome that is around 4cm wide, when thrown it will erupt in a shower of red powder that will more or less make a circle with a 30cm diameter on the ground. 13 can only throw this up to 5 meters and it won't actually erupt into flames as soon it it comes into contact with someone, instead some form of kinetic energy will need to be applied and it will then burst into flames, what this means is that if 13 immediately shoots or even punches someone coated in the powder they will be set on fire. Enemies can set themselves on fire in this way as well if they try to brush it off. The powder starts to fall off within 5 seconds of being on exposed skin and taking a lot longer on enemies who are wet or have fur. This move is especially powerful against anyone who can turn themselves into a liquid or sand because the grains will stay on them when they turn back, this can make the phospher pistol much more effective but if they turn into animals, can teleport or move extemely fast the dust will fall off. The glass that hold the powder is made to cause damage, it will annoy the opponent and possibly cut them but the glass shattering isn't the point of the move. The glass can trigger the powder though but this is highly unlikely with the amount of time it takes for it to settle and with the chances of the glass staying in the area. The fire will only set the person on fire where the dust touched which will be a reasonably small area. When it sets on fire the dust can be brushed off extremely easily. 13 can only have five of these on his belt at once and taking them out of his backpack and putting them onto his belt will around 10 seconds. They are farily accurate but travel slow so dodging isn't hard. The fire is used mainly as a distraction but if left can cause up to a second degree burn. 13 throws them at 50 KMh so an opponent who is skilled enough could easily catch them and send throw them back. Metal flows out of the ground and 13 and pushes him on top of what will soon turn into a dragoon. The height of the dragoon is roughly 21 feet tall. While 13 is on top of it, a servitor will pilot the vehicle allowing 13 to put all of his focus into killing the foes of the omnissiah. A rust red, oversized omnissian axe which is about 1 and a half meters high with a cog shaped blade. It is used as a heavy chopping device to get through armour but it can't be used quickly or with as much skill. Because it's unwieldy, its main use is keeping enemies away so 13 can have more room to use his guns. It is attached to 13's back by a magnet in his spine, it takes 3 seconds to take out and put back. The head of the axe is a semi-circle 30 cm long and 10 cm wide. 13 has two Mechendrites coming out of his shoulder blades. They are 60 cm long metal tubes with an area on the end where different tools will come out depending on the situation. Other than that, they function like normal arms and will take as much damage as 13's normal arms would. The Flechette Blaster is a small pistol in 13's coat, it has 10 darts that travel as fast as a bullet in a single cartridge and will shoot all of them with a single press of the trigger in a second however this causes the gun to move up 10 cm, throwing off the aim. When a dart his the target it will emit a homing beacon, making other darts change their course to focus on one area. The darts by themselves deal low amounts of damage but can stack up to hit harder than 13 normally can. The darts will only change direction if a new one hits, so if the target moves left they can easily avoid the other darts. The darts can move up to 90 degrees each time one hits and will continue moving as fast as a bullet while making those turns. It takes 3 seconds to reload. There is a small amount of sideways recoil if 13 only uses one arm to aim, although if he uses multiple arms to control it he will have to slow down. A Mechadendrite folds under 13's hood and comes out with a cognis flamer attached. This weapons deals very light damage to a cone 20 metres long and 5 metres wide, although the heat can be felt much farther away. The fuel canister can last for up to 45 seconds of continuous firing before it will have to dip back down to refill for 15 seconds or unattach. It has a minor machine spirit that can fire by itself although it will be less accurate (not that that matters too much on a flamer) but will have slightly better reactions and can look wherever 13 isn't at the moment. The canister can be shot which will break that flamer, of which there are four in total, and cause a small explosion that will damage everything in a 3 metre radius. Perkins is an imperial guardsmen, he is equipped with a lasgun which is significantly weaker than a bolter that the space marines use. The armour he wears is green and consists of a helmet, chestplate and long pants with armour on the front side. The armour is enough to stop a lasgun or some shrapnel but it will fail if a prime tries to attack it. There was a new ork menace to the Imperium, one so big that it threatened even Holy Terra itself. It was the Beast, a group of 6 orks who had become powerful enough to speak fluent gothic and command the biggest ork armies that had been seen before. 13-Jzall was sent to assassinate these orks before they could attack the milky way, 13 failed and was killed by an ork who spotted him too soon. Just as his soul was about to be claimed by the warp Omni brought him back to life in the form of a prime. 13 has a somewhat god complex when it comes to most things since not only does he think that he is the smartest person in the area but he often is. The over 10,000 millennia alliance the Adeptus mechanicus has had with the Imperium means that they have amassed on of the largest collections of knowledge in the galaxy. Because of, this anything that 13 might know chances are he will. This also makes him one of the best shots in the Omniverse as long as he isn't in a battle situation. 13 has two 'modes' one is almost completely emotionless and the other is like a normal person. 13 is, by default, normally in the emotionless mode but can switch at a moments thought his emotional state. This state shows how 13 would be as normal person, nice and able to carry a conversation well. 13's mobile dataverse station and communicator are located on his blue eye protectors, the screen pops up on it and 13's mental signals act the same as a mouse and keyboad making whatever he wants to happen on the screen happen. "The orks seemed to have stripped 13-jzall's robes of most of it's armour, although it is still salvagable." A sea of bodies was in front of the ranger team, the tyranid swarm was distracted with the sicarian killclade in front of them but that didn't make their job any easier. X-93's omnispex found the most direct path towards the hive tyrant, the 4 other rangers lined up their plasma calivers and fired. The only thing left on the battlefield was charred and broken chitin, and a giant skeleton covered in melting flesh. The battle had been won in a single shot. Almost all of my men were taken out before we saw what was happening, the last thing I remembered before being captured was a flash of blue and my leg breaking. "Dat puny 'umie got krumped pritty fast but e' had a roight good choppa on 'im, almost lost one of me boyz! An ork attempting to tell the best story to the other orks in the few moments with no battle. The ranger saw the path in the way of the omnissiah's glory, STC in hand ran through the forest with plague marines behind him. Even the forests turned against him yet they could still not catch him, the Omnissiah's STC was not to be lost, failure was not an option. Luckily, it wasn't possible either. "You can't sneak up on them, they KNOW where you are. If it's from cameras, servo-skulls or just them knowing with no ways of seeing you, they will kill you before you get close. You'd have an easier job putting cadia together bit by bit." Unnamed guardsmen speaking about the skitarii warrios of graia after an attack against a night lords warband.